Looking for a thrill in the Wisconsin area? New to extreme sports? Or are you an old hand just looking for somewhere new to try? Whatever your experience level, there is something to meet your needs and what better extreme sport to start with than skydiving in Wisconsin? The Wisconsin climate varies from season to season (it’s generally called a “humid continental climate,” and it can get cold in the winter, so it may be best to opt to skydive in the spring or fall, when the weather is not too hot and not too cold. But what really makes Wisconsin ideal for skydiving is that, as a general rule, the winds are neither too high nor too fast. Experienced or amateur, you need to find a reputable place to jump. 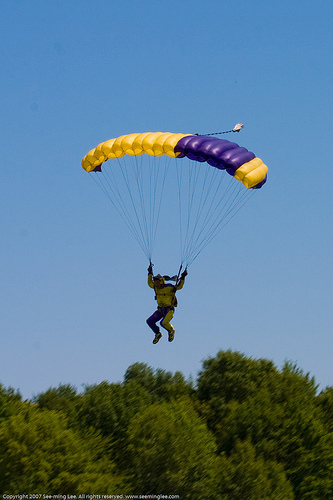 It’s easy to find details of skydiving in Wisconsin companies – internet, telephone directories, etc. – the Wisconsin Chamber of Commerce also holds details, and might be a good place to start. There are even not for profit clubs available. When choosing a school or company, make sure that you check that the instructors are fully qualified – they should have US Parachute Association membership cards (the USPA certifies all skydiving instructors in the US). Do your homework well – a few people have been caught out by paying money to companies that only exist online. And that wouldn’t be a good start for a skydiving in Wisconsin experience. Ask the skydiving center for full details of their terms and conditions – some will give a refund (if for some reason you can’t make the jump at your scheduled time), some charge more for photographs (and you will want your jump photographed, believe me), etc. You need to know what you are getting for your money. 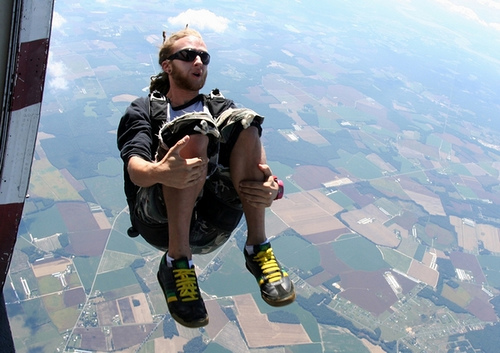 Once you’ve chosen your skydiving club, it’s time to decide what kind of jump you want to do. Am I Really Going to Jump out of an Airplane? The truth is, there are lots of reasons people take part in sky diving and extreme sports in general – some are thrill seekers, and this is just another thrill; some are coerced by friends; some do it for charity; sometimes is just seems like a good idea at the time. Although some places may call them different names, essentially, there are three types of jump: Static Line, Tandem Jump and Accelerated Free Fall (AFF). Static Line – Most Wisconsin skydiving centers will give you a couple of days training for this (you do need to know how to land and it isn’t as easy as you might think. You have to remember to keep your knees and ankles together, and if, like me, you struggle with two things at once, you will need training if you have never jumped before). Then, on the day scheduled for your jump, you are attached by a line to the aircraft when you jump out. This Static Line causes your parachute to open automatically when you are out of the aircraft. Usually, you will be jumping from a height of about 3,000 feet. This is certainly one of the jumps to consider if you are a beginner. Tandem Jump – This is generally considered to be the easiest and quickest method. Basically, you and an instructor wear a dual harness, so that you are strapped together (facing away from each other). Because you have someone experienced to, effectively, do all the work, you don’t have to train for as long – usually, only about half an hour. You will usually jump from an aircraft at 10,000 feet, freefalling until about 5,000 feet. Some centers will let you perform some turns during your free fall. This is definitely the one for those of us who are really scared and only doing the Wisconsin skydive to appease our friends. Accelerated Free Fall – Even if it’s your first time, you can still do this, but the training will take longer. (Remember, the Wisconsin skydiving organization with whom you are jumping does not want you to have an accident. When you are choosing your school, you should ask how long the training is for each type of jump, and bear this in mind when booking.) If you are a beginner, you will usually be accompanied by a couple of instructors on your first two or three jumps. They will give you clear instructions, by way of hand signals, to tell you to straighten your legs, or do various types of rolls, etc. As you progress in this type of skydiving, you will be taught to fly your parachute and navigate it so that you have a bit more autonomy. Is there anything else I need to know about Skydiving in Wisconsin? No matter how careful you are, skydiving has its risks. Of course, so does crossing a road if you don’t take the right precautions. It’s really about being sensible, and paying attention during your training. If you have any medical conditions, it is best to tell the instructor before you start, so that he or she can take the proper precautions. Generally speaking, if you weigh more than 250 pounds or have a heart condition, you may not be allowed to jump. You also might want to think again if you suffer from osteoporosis or any other bone or joint condition. And it probably goes without saying; don’t try to jump if you are feeling ill on the day. As with all sports, some people do have accidents (but they do playing football too) and it might be a good idea to check your mortgage and other insurances to make sure that skydiving doesn’t adversely impact on them. Most accidents associated with weather (drifting in the wind, for example) won’t happen because the skydiving center won’t let you jump, but make sure that you are aware of the risks before you start. Provided you follow instructions, and do as you are told, you should have a wonderful time skydiving in Wisconsin. See you on the way down! This entry was posted in Air Sports, Sky Diving, Travel, United States, Wisconsin and tagged Sky Diving, Wisconsin. Bookmark the permalink.